Travellers from the Asian region are looking forward to travelling this year, with 49 percent wanting to spend more money on their trips in 2013. According to a recent study, Thai’s have an even bigger year ahead with 83 percent intending to increase their travel spending budgets. TripAdvisor has revealed that out of the 1,600 accommodations surveyed in Asia, 79 percent reported 2012 to have been economically successful, with 24 percent even saying that the past year was “very profitable”. Unsurprisingly, 72 percent were optimistic that 2013 would also be a profitable year. This optimism in a successful year seems to also be encouraging Asian accommodations to increase the hiring of staff with 19 percent of respondents planning to add new jobs in 2013, whilst 42 percent intend to increase room rates. Travel review websites are having a significant impact on travellers with 62 percent of respondents from Asia, including 68 percent of Thai’s, looking at the websites. Travellers named travel review websites to be the most useful source of information, with web based travel agencies and travel operator websites coming in second and third place respectively. 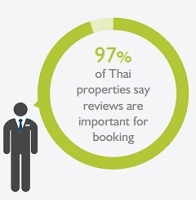 Moreover, 95 percent of Asian travellers said that people’s opinions and reviews on travel review websites influenced their trip and 97 percent of accommodations thus believe that online reviews were of crucial importance in generating bookings. Furthermore, 31 percent of Asian travellers were writing reviews after their trips and 91 percent of Asian accommodations were actively monitoring those reviews and controlling their product’s online reputation, with 71 percent responding to positive reviews and 78 percent responding to negative reviews. On the other hand, 28 percent of accommodations reported that their own websites generated the majority of bookings, followed by online travel agencies at 24 percent. 13 percent of booking were generated through the accommodation’s own mobile app, however 79 percent of Asian travellers said that they thought it was beneficial for such a booking channel to be available with 74 percent of accommodation providers agreeing. Nevertheless, only 39 percent of accommodation providers had mobile friendly websites and a mere 25 percent had special offers for mobile device users. If you are an accommodation provider, will you be improving your online networking habits? Click here to read this on e-Travel Blackboard. This entry was posted in *My Portfolio*, *Travel News* and tagged Accommodation, Alisa Nemirovska, asian region, Asian Travellers, Backpacker, Cricket’s Aunty, Profits, Solo, Thai Travellers, Travel, Travel Blogger, Travel News, travel operator, Travel Operator Websites, Travel Review Websites, TripAdvisor, Web Based Travel Agencies on April 7, 2013 by Cricket's Aunty.